The story of a doting but frustrated wife of 1870’s Indian upper class society is both a luscious technical dynamo, a sharp socio-political statement of female empowerment and a good old fashioned reserved melodrama. Cited by the Criterion liner notes as Satyijat Ray’s finest film, Charulata, indeed, with every frame of this picture we can’t help but feel a master filmmaker’s stroke guiding us through his chosen microcosm of Indian life. 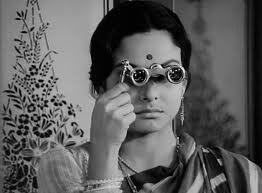 An amazing opening sequence sets up this highly visual form of storytelling - a virtually silent sequence of the lovely title character Charu observing her surroundings using her opera binoculars. Expressive Scorsese-like camera moves mixed with modern-style extreme close ups instantly lift this film from its age. With little words we easily figure out who Charu is, a beautiful figurehead of a Bengali upper-middle class household, wife of Bhupati, who in 1870 Calcutta runs a liberal newspaper which seeks to further the cause of Indian independence. Poor Charu, as customary to the time, rarely leaves the house, instead serving the lonely role of the weathly homemaker. The spark which enters Charu’s life is Bhupati’s cousin, Amal, arriving to stay with them in the house. Unlike the strong-willed left-brained hubby Amal is an artist, an aspiring poet who lives with a carefree unattached attitude. Charu, who also dreams of becoming a writer, is hence attracted. Thus, a very delicate and textured courtship slowly evolves, always kept in check by the realities of the time, but enough brooding sexual tension to smolder the screen. Much of the film takes place within the confines of the estate, reinforcing the feeling of a sequestered life from Charu’s frustrated point of view. When we do see outside Ray develops Bhupati’s story, a sympathetic man himself who holds his strong convictions dear but struggles to run a business and keep his political credibility intact. The demand for a gossip-free political paper is slim but we can’t help admire his tenacity. It’s a tragic trajectory in most respects. The losses which befall Bhupati and the inability of Charu to express her feelings to Amal are quietly powerful. Moments of quiet silence effectively create a strange kind of suspense. Whether its Charu’s deep rooted self loathing or even the moment Charu and Amal find Bhupati not yet home at the end the day indicating something dire has happened there’s a cool patience to Ray’s pacing, maximizing every morsel of drama. The final moment in the film is arguably one of the most memorable in the history of cinema. The visual aesthetic of the film is bursting with ingenuity and cinematic life. Among a number of impeccably crafted scenes is a stunning Felliniesque daydream sequence anchored by a beautiful extreme close-up of Charu sitting on a swing staring into the camera. Through this attention to the moment and the craft of the individual scenes against the story as a whole we can’t help see an influence in the more renowned works of Martin Scorsese or Francis Coppola.